[box style=”rounded” border=”full”] NOTE to Ram – create 2 separate pages, one for ePortfolio, one for log entries? E-portfolio use rating scale – am I sinking or swimming? How do I add an assessment if I am not the nominated supervisor? In this section, we will attempt to explain why we need an ePortfolio and what it’s all about. As you’ve probably noticed, a record of personal development and experience is becoming mandatory for all doctors. It provides evidence that training has taken place and allows the doctor to reflect on a range of learning opportunities. By making use of the full capability of electronic systems, the ePortfolio can be used to record, monitor and manage a GP trainee’s learning all in one place. 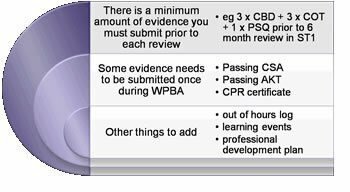 By providing a structure for documenting the evidence harvested through Work-Place Based Assessment (WPBA) tools, the ePortfolio helps to ensure that judgements about the GP trainee’s progress and achievement are based on a clear, systematically recorded picture of competence. Above all else the Trainee ePortfolio is where the GP trainee records their learning in all its forms and settings. Its prime function is to be an educational tool that will record and facilitate the management of the journey of clinical and personal development through learning. YOU to reflect on your learning experiences to see what you’ve got out of them. It helps you think about your experiences and particular patient encounters. It also signposts things you should know so that at the end of training you’re ready and safe to practice as an independent GP. THE DEANERY with quality assurance – that you have acquired the minimum competencies to practise safely. THE PUBLIC by reassuring them that you have gone through some rigorous structured training. This gives them faith in our profession and reassurance that their tax money used for training you is justified. The diagram on the right shows some of the sorts of things that should be included in your ePortfolio. And you’re not the only one that can put stuff onto your ePortfolio. Your trainer, Clinical Supervisor (e.g consultant in hospital posts) and Educational Supervisor can also add notes and comments. At the beginning of specialty training, when a GP trainee registers with the Royal College of GPs (RCGP), they will be given access to the RCGP Trainee ePortfolio which will be used throughout the training period, in both hospital posts and primary care. It is accessed and updated through the internet. Although the ePortfolio belongs to the GP trainee, key parts of it are accessible to the GP Trainer, Hospital Consultant, Educational Supervisor and deanery administrators through a permissions system. The trainee will use it to record their learning experiences and reflections. The trainee’s Educators (like the Clinical Supervisor, Educational Supervisor, Training Programme Director and so on) will use it to record things like the trainee’s assessments, progress and reviews. It must be used at all stages of training to document the assessments. The assessments recorded in the Trainee ePortfolio will be drawn from performance and evaluation taking place in the real situations in which doctors work. The Trainee ePortfolio should also be used to record and validate naturally occurring evidence against the competence framework. This is evidence which occurs in the course of practice and which illustrates the GP trainee’s competence. For example, the trainee may do an evidence review on a specific topic and present it to a practice meeting. This might be taken as evidence of data gathering and interpretation, or communication skills. Evidence that a trainee is late for ward rounds on a regular basis might be discussed with the them and recorded under teamwork. Naturally occurring evidence needs to be validated by the Clinical Supervisor (GP trainer in GP posts, Hospital Consultant in hospital posts). All entries can be tagged to the competence areas so that an overall picture of competence is easily accessed. It also allows competence in areas such as team-working to be appraised in a manner which cannot be done by the AKT and CSA. The ePortfolio will detail achievements in the various MRCGP exams – namely, AKT and CSA. It has a diary and a mailbox. It also contain links to learning resources that are being developed by the RCGP and has a personal area where individuals can save files, documents, certificates of learning and other digital materials. In general, the ePortfolio might be described as the “glue” which holds the curriculum learning and assessment together. You don’t understand its value (either for you or others). You don’t know what sorts of things to include and not to include. Perhaps you haven’t got into a routine of doing it and need some suggestions. Perhaps you’re anxious about writing in it because you’re afraid who might see it. These are valid reasons but the unfortunate thing is that it is only you who will lose out if you don’t tackle this EARLY. You are assessed on your ePortfolio (as well as the WPBA assessments) and we have known GP trainees who have been asked to repeat a post simply because there is a lack of evidence in the ePortfolio to give them ‘a ticket’ to move onto the next year. At the very least, please talk to your Trainer or Educational Supervisor about it EARLY on. They won’t be upset, they just want to help you. Far too often, trainees leave things right until the end – and that’s when chaos breaks loose. Here are some suggestions from our trainees who have struggled. May be something here might help you. Is it because you don’t know what to write? If so, read and familiarise yourself with the curriculum headings and what they mean. Also read our ePortfolio Pearls document (in the downloads box above). Is it because you’re struggling to find the time to add entries? Then consider coming in half an hour early each day during your hospital or GP posts so that you can add some log entries. Alternatively, leave half an hour at the end of you shift. If it takes ages to drive home (because of rush hour traffic e.g. after half day release), consider leaving later. If you’re in a GP post, think about loading up the ePortfolio at the same time you log into the GP clinical system before starting surgery. In that way, you can add ‘rough notes’ on interesting patients you see and smarten them up later. If you get GP surgery admin time, you should use that to add entries. For those in hospital posts, try and use ‘gaps’ in your working day as opportunities to add stuff on. Some people like to buy mobile broadband. That helps them to put ePortfolio entries on more flexibly. Is it because you’re not particularly good at typing? Typing with speed definately makes the job of adding log entries less cumbersome. If you’re typing skills aren’t very good, consider investing in Mavis Beacon Teaches Typing – it only costs £20 and I guarantee you’ll be loads better within 2 weeks. And it’s important to acquire typing skills right now – because the rest of your future career requires you to type well. You can also invest in a speech to text recognition program like Dragon Naturally Speaking. It works incredibly well. Those with iPhones can download Dragon Voice Dictate onto their iPhones and simply dictate as and when they see something interesting – the program will convert your dictation into text which you can then easily email to yourself to later cut and paste into your ePortfolio. Is it that you simply hate the ePortfolio and feel sick of the thought of it? Perhaps you do all this stuff in your head anyway? Perhaps you can’t see the point of it? If so, you need to change your attitude. The more you hate the ePortfolio, the more subconciously you will shy away from it. Start learning to love it a little. Make friends with it. Seriously, this often helps you feel better about adding entries. At the end of the day, you have to use the ePortfolio, even if it doesn’t fit in with your learning style. That’s the way it is I am afraid and it’s here to stay – so perhaps one needs to change oneself. If you ePortfolio is anaemic, only you will lose out. Start looking at it more positively. Perhaps you feel constrained by all the different boxes and their headings that you feel you have to complete within the ePortfolio? If you often struggle to find things to put in each of the boxes, then you need to ‘chill’ a little. It’s okay to leave several of the boxes empty. They are only there to guide you and for some people or some situations, they don’t work particularly well. Sometimes, trainees like to put i) what they learned ii) what they would do differently and iii) future learning needs lumped together in one box – because it’s easier for them that way. And that is absolutely fine. Quality is more important than quantity. Try and write about clinical encounters that mean something to you. Perhaps you found something interesting or learnt something new? Or perhaps something that was difficulty, dysfunctional, provoked some sort of emotion or reflection on your core values. You should aim to do around 3 entries per week (as a minimum) if you are in a GP post and 2 entries per week if in a hospital post. Long entries are okay. Longer entries tend to be deeper and more meaningful than very short ones. But remember – quality is more important than quantity. And remember the poor person reading you ePortfolio. So, whilst it is okay to write longer entries, this is no permission to waffle on and on. Be concise and focus. Try not to cover too many professional competency areas because you may find that you end up writing about them superficially. Instead, you many need to focus and go deep into 2-3 areas. Add your log entries in a timely way. Don’t save them up and add them all in one go a few times a year! This looks bad because it will appear you’ve only logged stuff in time for the ARCP panels as opposed to maintaining a continuous log and continuously reflecting. Try and structure your writing around the 12 professional competencies. After all, at the end of the day, it is those 12 things against which you are ultimately judged. A good way of doing this is to write about your clinical encounter or event as freely as you want first. Just get it out onto paper or the screen. Then step back and try and think which main professional competencies you are talking about. Then restructure you written piece around the professional competencies you are demonstrating and tweak them to make them more robust. Try and write about curriculum areas where you need to provide more evidence of coverage. There are some areas which won’t have many entries (like Learning Disabilities and Genetics) – but all others should be in double figures above 20 by the end of ST3. But start working on coverage EARLY. You’ll have too much to do in ST3. As a minimum, there should be some sort of interpretation, reflection and action. And remember, you don’t have to fill in all the boxes and subheadings in the ePortfolio – that’s just there to guide you. One word of caution though about future learning plans – writing “do more reading” is irritating because it doesn’t consider the other ways you might fill a learning gap (and doesn’t get done either). So, avoid writing this too often. If you do write it, explicitly state which resource you are going to read rather than ‘A book on Dermatology’. The explicitness tells us that you’ve really thought about it. As you can see, there don’t need to be many of them. The whole point of the PDP is to help you focus on what it is that you want to achieve and by defining this, you end up with a navigation tool that will direct you over the next 6 month post. PDPs should reflect your learning needs. Learning needs can only be one or more of Knowledge, Skills or Attitudes. Therefore, try and define you PDP item explicitly by defining what knowledge, skill or attitude you are trying to build on. Remember, you can “Send to PDP” those outstanding things from your learning log – it saves you writing it out all again. To add structure to your PDP item remember the mnemonic SMARTIES: PDP items should be Specific, Measurable, Attainable, Realistic, Time Framed, Inspirational, Emotional, Successful (see below). Add further structure by numbering or bulleting the list of actions you need to take. And if you don’t have time to write out the PDP item completely, why not just add something ‘quick and dirty’ for the time being to serve as a signpost for you to smarten up later? However, your PDP may change throughout the course of your post as new and more important learning gaps and needs are identified. It is completely okay to change your PDP and prioritise things. PDPs are meant to be alive and dynamic – changing with the external environment and its demands. Specific : make the goals small and achievable. Measurable: use time or amount. Attainable: take into account the resources, time available etc. Realistic :are the outcomes realistic within the time frame and circumstances. Time: the goal will be achieved by what time or date? What can you realistically do this term? Define the time-frame. Inspirational: will this goal make a difference! Emotional: the item should engage you on some emotional level. For instance, it might make you FEEL satisfied, excited etc. Successful: it is important everyone agrees what success is! What does it look, feel or sound like? It’s more practical – it’s very time consuming for an ES to go through all the eportfolio entries and validate them and still have time to do your Educational Supervision. Most will probably end up losing the will to live and we need to keep our Educational Supervisors enthused! And we need to protect the Educational Supervision time for the other important elements of Educational Supervision. The trainer can read the entries in a progressive way throughout the 6m attachment. That means they can also provide feedback in an progressive and incremental manner rather than a whole mass of feedback being dumped by the Educational Supervisor. We hope this will enable the trainee to develop better reflective skills in a progressive manner too. Finally, continuously reviewing how their trainee is engaging with their ePortfolio provides the trainer with another informal form of assessment on how the trainee is progressing (through their level and depth of reflection as well as active engagement).